ABRANET® sanding Mesh Lasts Longer and Sands Better. Perfect for the rough sanding of your lathe project. 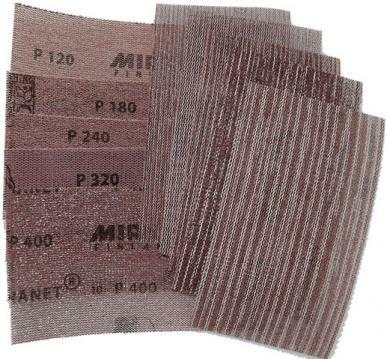 Mirka Abranet™ is a hi-tech abrasive that is extremely aggressive and very efficient. The dust passes through the mesh as you use it making sanding faster since the clogging build-up is eliminated. It lasts longer far longer than conventional sand paper and you'll get far superior sanding results in less time. <p>If you use Micro-Mesh, there is no need to sand any finer than 400X since the 1500 Micro-Mesh is equivalent to the 400X Abranet® but has a more consistent scratch pattern.